The three major pest species of rodents are the Norway rat, the roof rat, and the house mouse. These three rodents are known as commensal pests, which describes their ability to successfully cohabit with man. They are common in the main population centres in Australia and most countries throughout the world. Since early times, rodents have been responsible for the loss and contamination of feed from the crop stage through to the storage of processed food in both domestic and commercial premises. Rodents have been associated with the transmission of disease organisms, the most notable being the occurrence of Bubonic Plague in Europe, causing the loss of 25 million lives. As climatic conditions become less favourable during the onset of winter months, rodents move indoors looking for both shelter and food, however, in commercial premises rodents can be a problem all year round, and in certain instances, mice can attain plague proportions in rural areas. Rodents construct their nests utilising soft materials, such as shredded paper or fabrics, close to areas where they scavenge for food and water. These nests are usually situated in wall cavities, roof voids or underfloor areas, and in the case of Norway Rats, in burrows in garbage tips, and other similar sites. The adult female is capable of giving birth to 4-6 litters per year, each letter continuing between 5-10 young, which themselves are capable of reproduction three months after birth. Within a period of a year the mating of a single pair of rodents can result in a rodent population of 400-700. Rodents actively forage for food at night using the same routes of movement to and from the food sources. Their diet includes food material of both animal and plant origin and apart from mice, access to water is necessary. Mice can obtain water from foodstuffs providing the food is sufficiently moist. Although the vision of rodents is poor, they are complemented with other senses which are extremely sensitive. Their sense of smell and taste are so highly developed they can detect minute quantities of chemical in foodstuffs, and this can lead to ‘bait shyness’. They are equipped with whiskers and guard hairs, which enable them to feel their way in darkness with little difficulty. As previously mentioned, rodents are nocturnal and therefore activity is seldom observed during daylight hours, so it is important to recognise signs of their presence. Rodents deposit their droppings on all surfaces over which they travel and this, together with stains caused by their almost continual urination, provide obvious indications of the presence of rodents. Greasy smear marks also become evident along their main routes of movement where they make contact with obstacles. Rodents are equipped with incisor teeth that continually grow, and it is essential they gnaw at frequent intervals to ensure they are sufficiently short to enable them to feed and fight. 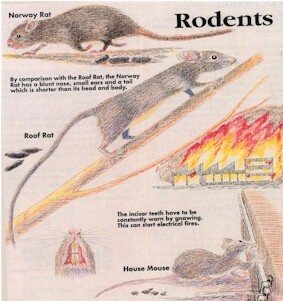 Fire can result from the short circuiting caused when rodents gnaw electrical conducting. As with all pest management programs, an Integrated Pest Management (IPM) approach is an integral part of successful rodent control. IPM involves consideration of all control procedures including attention to sanitation and hygiene, trapping, proofing of entry points, and the use of baiting procedures. All control procedures are preceded by a thorough inspection of the entire premises to identify the rodent and to define the extent of infestation.